Liz Curtis Higgs is the author of 37 books, with 4.6 million copies in print. Her latest release, 31 Proverbs to Light Your Path, shows how thirty-one nuggets of truth reveal God’s faithfulness: “I will instruct you in the way of wisdom and lead you along straight paths” (Proverbs 4:11). In another recent devotional, 31 Verses to Write on Your Heart, Liz explores 31 favorite verses chosen by more than a thousand women. In her best-selling Bad Girls of the Bible series, Liz breathes new life into ancient tales about the most infamous—and intriguing—women in history, from Jezebel to Mary Magdalene. Scripturally sound and cutting-edge fresh, these popular titles have helped more than one million women around the world experience God’s grace anew. Liz spent a decade as an award-winning columnist for Today’s Christian Woman magazine. Her articles have also appeared in Faith&Friends in Canada, WomanAlive in Great Britain, and Enhance in Australia. 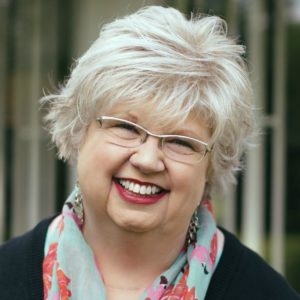 Liz Curtis Higgs brings biblical, encouraging, down-to-earth, and profoundly funny messages, helping brothers and sisters embrace the truth of God’s amazing, unchanging grace. Liz’s dedication to platform ministry has not gone unnoticed. In 1995 the National Speakers Association honored Liz with their Council of Peers Award of Excellence. Her alma mater, Bellarmine University, presented her with a Distinguished Alumni Award in 2005. And she received an Honorary Doctorate from Georgetown College in 2010.